We are from Edinburgh, Scotland. Liam and I (William) met in high school. We met Jack a few years later in a music shop in Edinburgh. We heard him playing some Slayer riffs and got talking. At the time we thought nothing of it until we needed a guitar player for the band. The only thing we could remember from that meeting was what Jack looked like and that we thought his name was maybe “Kevin”. Eventually we came across a Gumtree advert from Jack himself looking for a band to play with, so luckily we reunited. We met Oliver at our first ever show, he was playing with his rap metal band at the time called Blueprint Makeover. We’ve more or less been friends ever since and when our former guitarist Andy left the band Oliver was top of the list to replace him. Disposable started around 2009, but didn’t get into playing gigs until 2011. The original line up played until April of 2017 and then we got Oliver on board. So with this line up, around 7-8 months officially. But overall, about seven years! Originally we were called Disposable Heroes after the Metallica song, but a lot of people were mistaking us for a Metallica tribute band. It got to the point that we really wanted to solidify what the band name was without having to drop the name completely, so we just chopped the “Heroes” off. It left us with a really ambiguous band name, but I think since then it has taken on a whole new meaning. I’ve heard people interpret it in a lot of different ways, which is cool. My main influences are thrash metal, death metal and old school progressive rock. Jack loves a lot of thrash metal too, but I think a lot of what he listens to now is more evil sounding blackened thrash, black metal and death metal. His roots are definitely the Big Four, though. Oliver seems to listen to everything under the sun and really has no cap on his creativity, which is great. Liam loves punk and is always looking for a way to bring a punk edge to everything we do. I think our music at this point, especially the newer stuff we are writing is a really true split of our influences. The roots are still thrash but there are more evil, death metal-ly sounding sections, more high raspy blackened vocals, as well as big choruses with clean hooks and melodies. At this point we’re trying to push the “thrash” sound as far as it can go without dropping that as the fundamental starting point. The lyrical themes differ quite a lot. On our debut album, which came out in 2014, a lot of the lyrics were about a specific subject matter, or about a certain film or a certain book. The lyrics were about things that meant something to me but apart from the song “Addiction”, none of the lyrics on the album were really about anything personal. The approach to the Life Misguided EP in 2016 was to write more personal lyrics, so more or less everything on that release is about our own personal experiences or emotions. We’re carrying that theme in to the writing of album two. We always try to be energetic on stage. That’s really always what we have enjoyed doing the most. We’ve always said that we’d rather sacrifice 20% of the perfection to gain 20% in raw energy. That to us is the way it should be. Obviously we do our best to keep things as tight as possible, and take a lot of pride in playing our songs well, but it’s just more fun for us to go a bit nuts on stage, so that is what we do. As for how many shows we have played, I would guess around 100, probably a little more. There’s not actually too many things that stick out as being “wild” to me at any of our shows. We’ve had a broken nose in the pit before which was pretty sick. Especially when the guy seemed so delighted to have done it. I use a Sterling Sub series bass. It’s basically the poor man’s Music Man, but its comfy and sounds really good. I play through a Korg Pitch Black tuner into a Darkglass B7-K overdrive pedal. My stack of choice is my Hartke Hydrive Cabinet with Hartke HA5500 amp head. Oliver uses a Stephen Carpenter signature 7 string Telecaster which he feeds through a Dark Terror as a pre-amp into his Line 6 HD PRO X.
Jack uses a couple of Schecter guitars, he plays through a pedal board that consists of a tuner, a Zakk Wylde signature wah pedal, a tube screamer and an ISP decimator. He uses a Peavey Valve King 100watt amp head. Liam has a Mapex Meridian drum kit, a pork pie squealer snare drum, Sabian cymbals which include 14” hi hat, 16” crash, 18” freak crash and 20” ride. That’s more or less our lot. 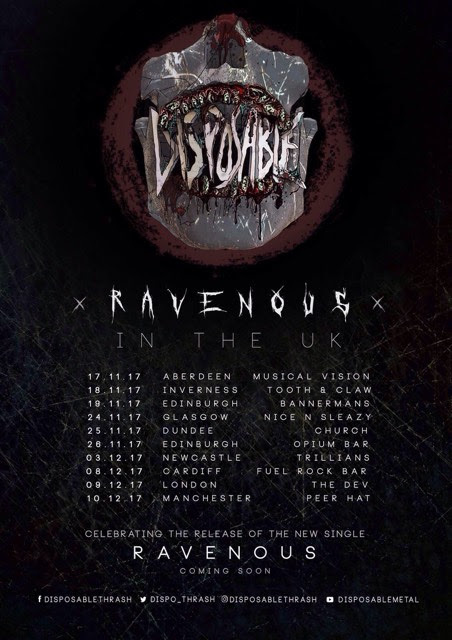 We’re going to obviously release the new single and hit the road, but other than that I think we’re just going to try and put ourselves on the map again with the new song, continue to write the second album which will be coming out in 2018, which we have quite a lot of songs ready for already. Hopefully we’ll be playing a bunch of new places in 2018 and be putting out a lot of cool stuff. At this exact moment in time, based on what we’re all enjoying together, we’d probably play a show with Glasgow crossover band Kingpin and have Puppy to headline. From previous Band of the Day The Crawling: Being in a band can be as much of curse as a source of enjoyment and satisfaction. What keeps you going when things get tough? There are really not too many aspects of being in a band that we don’t like. I know Liam doesn’t like being stuck in the back of a car for very long, but the rest of us don’t mind that at all. We’re all really enjoying the writing and the playing side of things right now, so for us the amount of fun we have really outweighs the amount of stress it causes. I think being asked to play Heavy Scotland was a moment that made us feel really respected as a Scottish metal band. We really appreciated that slot a lot and we had loads of fun playing. Supporting Municipal Waste was a really cool one for me too. Also releasing the album and the EP was really cool. It’s all worth it for me because we really try not to worry too much about anything and even when we’re faffing we’re having fun. And from Fathoms: How many Munnions make up a Horse Egg?